Just before crowds of music fans gather from across the globe to attend the Movement: Electronic Music Festival in Hart Plaza, the party begins when the Detroit Historical Society pays tribute to those who have shaped the city’s musical past. From 8-11 p.m. on Thursday, May 24, all are invited to Woodward Plaza outside of the Detroit Historical Museum, 5401 Woodward Ave., to share in one of Detroit’s most treasured stories as the birthplace of techno. The Movement and Renovation Kickoff will be set to the sounds of World Class DJ and Planet-E Communications founder, Carl Craig and opener Keith Kemp. The pre-Movement party and the Detroit Historical Museum will be open to the public and admission is free. Following the event, the museum will temporarily close to the public to undergo a 6-month project that marks the first major renovations on the museum since the 1960s. The renovation is part of the Society’s $20.1 million Past>Forward campaign. By Thanksgiving, visitors will explore new and expanded exhibits, enjoy technology upgrades and experience educational offerings at the Detroit Historical Museum. Among the new exhibits will be the Allesee Gallery of Culture, which will include significant artifacts from Movement festival artists. The Detroit Historical Society’s Past>Forward campaign includes the creation of Detroit Legends Plaza, on the grounds of the Detroit Historical Museum. The outdoor destination where this party will be held will transform to honor Detroit’s stars of sports, entertainment and media. It is set to be unveiled in September 2012. In preparation for Detroit Legends Plaza, influential Detroit electronic artists have been invited to cast their handprints and signatures in cement during the Movement and Renovation Kickoff. Juan Atkins, Kevin Saunderson, Eddie Fowlkes and Carl Craig will take a moment during the festivities to complete the castings. These performers’ handprints will join such noted Michigan celebrities as Martha Reeves, Gordie Howe, Al Kaline, Elmore Leonard and Lily Tomlin. "I'm excited that something like this is taking place,” said Craig. “To see something like a Detroit Legends Plaza happen, is to see a dream come true." 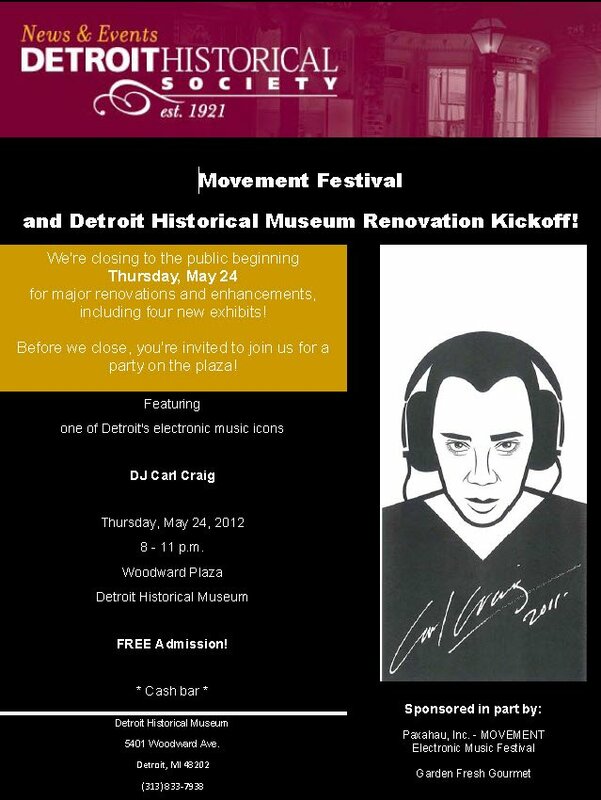 Featuring Carl Craig during the event, who made a name for himself here in Detroit and whose songs are known around the world, seemed a fitting tribute for a celebration that will preview not only the Movement festival but also a widespread renovation of the Detroit Historical Museum. A cash bar will be available during the Movement and Renovation Kickoff and Garden Fresh will provide snacks for party-goers.